David Abraham is to stand down as chief executive of Channel 4 after seven years. The broadcaster has confirmed that he intends to step down from his role by the end of 2017 in order to launch a new "media enterprise" next year. The news appears to have been broken slightly prematurely by Channel 4, who hastily deleted a tweet sent at 2pm before later confirming. Abraham, who succeeded interim chief executive Anne Bulford in May 2010, joined the broadcaster from UKTV, where he was chief executive. Abraham, who has been a vociferous opponent of the government’s potential plans for a potential £1bn sell-off of the broadcaster, is paid almost £900,000 by the broadcaster. 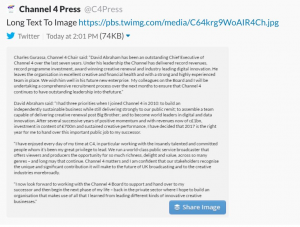 He said: “I had three priorities when I joined Channel 4 in 2010: to build an independently sustainable business while still delivering strongly to our public remit; to assemble a team capable of delivering creative renewal post Big Brother; and to become world leaders in digital and data innovation. "After several successive years of positive momentum and with revenues now of c£1bn, investment in content of £700m and sustained creative performance, I have decided that 2017 is the right year for me to hand over this important public job to my successor." Gurassa said he would be undertaking a "comprehensive recruitment process over the next months" to identify a successor. Internal candidates are likely to include Jay Hunt, chief marketing and communications officer Dan Brooke and sales head Jonathan Allan.